It is fast and saves your time, because there is no re-encoding of the edited audio files. 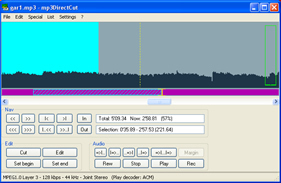 mp3DirectCut has a built in recorder that creates mp3 on the fly from your audio input. This is a tiny application (180KB of Zip file), works with Windows or Linux with Wine.